I bought a 2nd hand one for AUD10 and have so much fun with it. Highly recommend for every kitchen - I love to make my own ice cream / gelato that's not so sweet. Using a "mocha" recipe, my secret of mixing ovaltine + coffee + marsh mallow + choc chip... both gelato style (use water) and ice cream style (use milk) are great. Just be mindful that ovaltine is already sweeten, so less sugar is required. 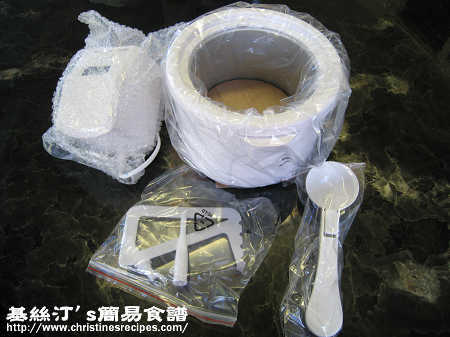 Next time will try to make red bean ice cream, wonder if Chrisine already tried? Wow, great sharing. Love to try your recipe too. I haven't tried to make red bean ice cream before. This weekend I was very busy around with experimenting this new kitchen-hand, and made green tea and mango ice cream. They were all gone in a few hours. BTW, what brand is your ice cream maker? It's very good bargain, AUD10. Did you get it from a garage sale? Seems like you had a very busy Christmas "holiday". Hereby wish you a very Happy New Year, and post us more easy recipes! Really looking forward to your advice on making red bean ones... if in time, want to make it for my parents for CNY - a cool red desert for a hot new year. It's pretty hot recently. I'd definitely eat more ice-cream during this summer. BTW, how about mixing ice-cream with chilled red bean paste? Sounds right? I got this ice-cream maker from one of the biggest supermarkets in Brisbane. Unfortunately, they don't have them available all the time. BTW, which city are living in? I feel bored and no work in this week so i browse website and wanna make sth. U know i just back from supermarket I wanna make split-pea and cocount cream pudding however i can't find any split-pea in supermarket. Here no chinese shop..so poor for me hahah. by the way, how much of your ice cream maker? I've been to Mel. twice to visit my relatives. It's a great city that many Chinese people living down there. 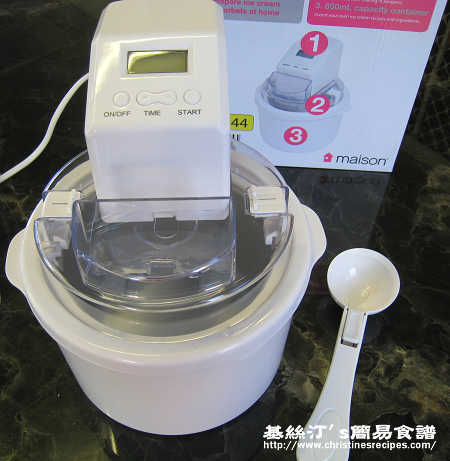 This ice cream maker costs only 20 dollars plus, not too expensive. You can find split peas at any supermarkets. I found them near the canned soups. You may ask for help from the staff at supermarkets. They would help you right away. it's very good price, i wanna get one. which supermarket? C or W??? I tried to looking for in canned food but cant find it..haha, anyway, i will try other supermarket tomorrow. How long have u lived in Aus?? are u study or working?? It's Aldi. I wonder if they have any stores in Melb. I've migrated with my family and lived in Australia over 16 years. I graduated in here 8 yrs ago but after that I went back HK to work..then last yr I came back again cos I wanna get my citizenship.